Many people don’t realize (or remember) how many online accounts they have, never mind how much personal information is stored within those accounts. When we die, our digital assets are often left to wander the online universe long after we’ve expired, and maybe even forever. There are, however, tools available today for collecting and storing information regarding our digital assets. These tools can help our surviving family members and other authorized loved ones to access important information and assets, memorialize or close accounts, and more. Setting up a digital asset storage system is a great way to ensure that all your digital assets are protected and able to be shared with those that you choose when you die. The following are some of the most popular and affordable digital asset management tools available today, and many of them also offer free versions. Many of them also offer additional tools and checklists for assistance with funeral pre-planning as well. Estate map offers an online portal for storing information, assets and wishes, that can later be accessed by those you choose. It boasts bank-level security, costs $96 for the first year, and then $24/year after that. Everplans offers a Digital Estate tool, to help store and project all your assets in digital form – such as your online accounts, social media profiles, music, photos, and more. All data is stored securely, in a vault that can be shared with authorized users. Free and premium rates are available. Estate Pass offers a service that is mainly focused on closing your accounts after you’ve passed away. It allows you to choose what digital information will stay private, vs. what will be memorialized publicly. It is free to start, and then you can choose from different packages and pricing. Will Digital provides a secure place to store files saved on your laptop or smartphone, and any online accounts, such as social media, email, cloud storage, etc. There are no shared passwords required. Instead, the company contacts your designated trustees after you pass, and they are provided with access information at that time. Membership starts at under $20/year. Safe Beyond offers secure digital asset management, in addition to the ability to send personalized future messages to your loved ones. A free trial available, and then you have the option to sign up for a paid subscription. Cake offers a place to keep all your preferences, people, data, and important documents securely in one place. A free version available, or, you may choose the Concierge version, which costs $120. Afternote is a free digital asset management tool, which also allows you to store and share your final wishes with loved ones. Information is kept secure during your lifetime, and can then be transferred upon death to those with authorization. The Torch is a highly secure digital asset management tool. There are no account numbers or passwords to save and keep secure. They also provide assistance with starting conversations about your wishes and digital assets. Free and premium versions are available. Additionally, we have created a helpful guide called Managing Digital Assets Upon Death that provides an in-depth resource for setting up access and management protocols for your digital assets after you’re gone. 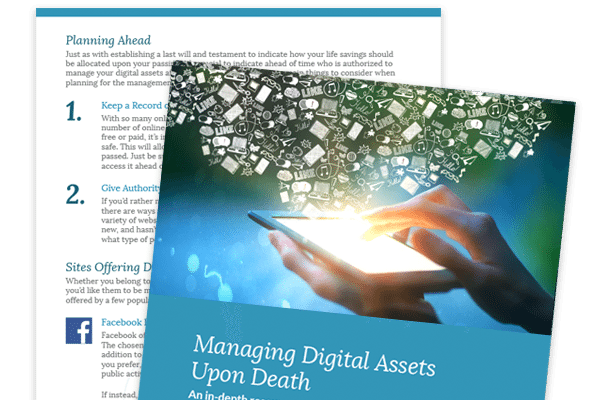 Get our free guide to help you set up access and management protocols for your digital assets after you’re gone.